a simple site to showcase some of our adventures in homesteading, Crafting and life. 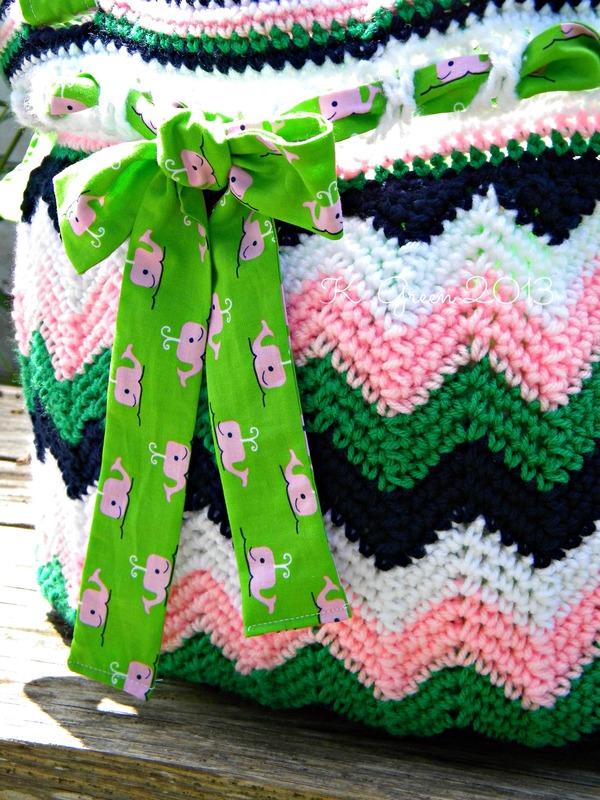 The first step actual step is to make your “Chasing Chevrons” crochet beach bag in your choice of colors. The pattern can be purchased from A Crocheted Simplicity by Jennifer Poink. 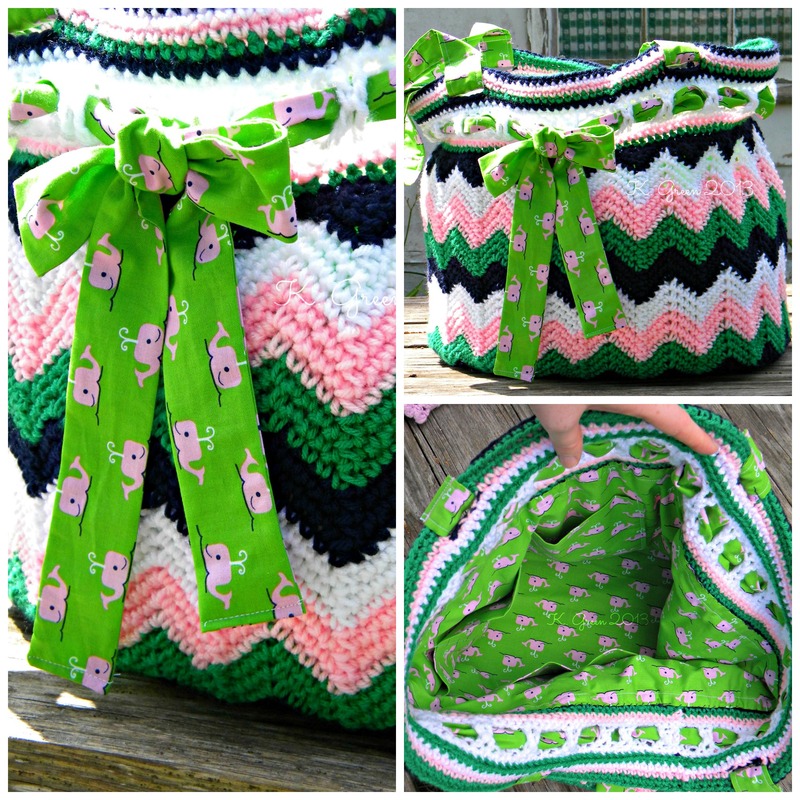 It is a very well written pattern with loads of pictures and the bag turns out beautifully as is. However, after loosing many small items such as pens and lip balms out of my last crochet bag, I wanted to add a fabric lining to my gorgeous chevron beach bag. 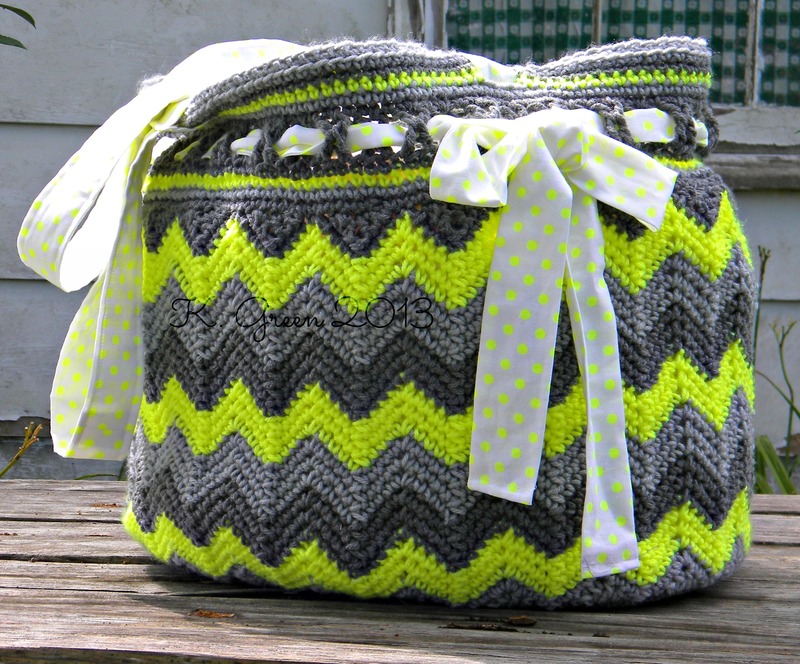 I have listed the yarns and fabrics I used to make the bags at the end this tutorial. For my bag, I omitted making the crochet handles and omitted the reinforced bottom with plastic canvas step. I also stopped crocheting at round 39, which omitted the last 4 rows that were meant to show through the X & O stitches from round 29. I used acrylic worsted weight yarns for my bags. 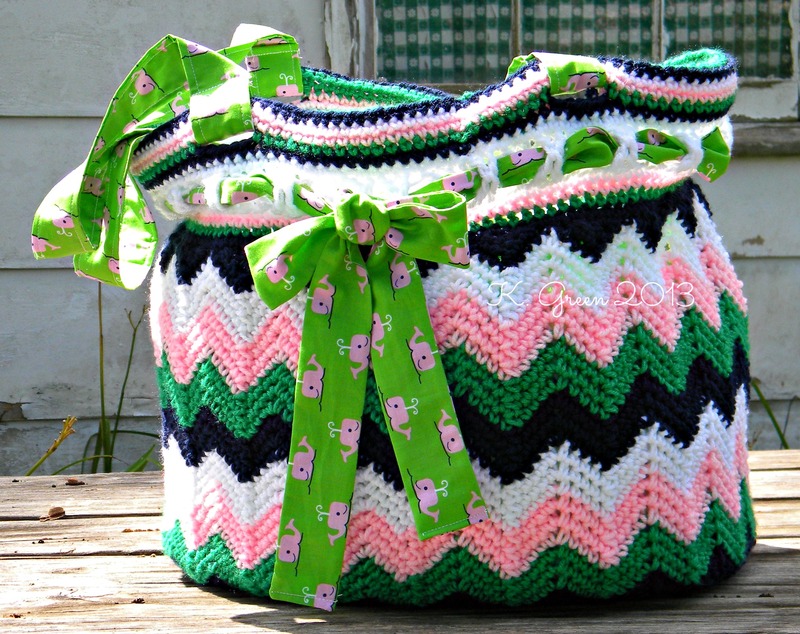 You can also use a worsted weight cotton yarn as specified by the crochet bag pattern. For reference, my bag measured 45” around. If your bag is smaller is larger than an inch or so, you’ll need to adjust your bag lining size a bit. From your fabric, cut the following pieces. Measurements are listed by WIDTH by LENGTH. 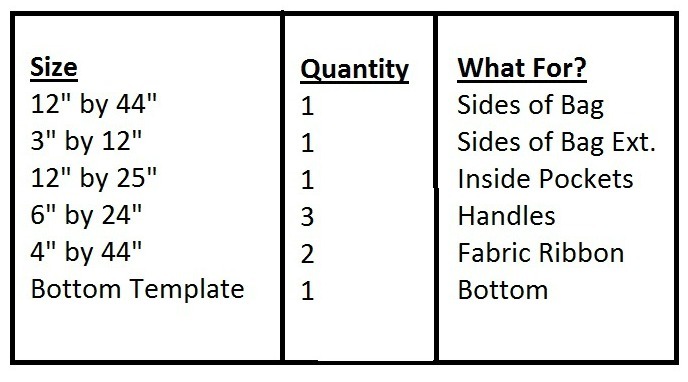 Plan your cuts of fabric accordingly if you are working with a fabric with a direction. I worked with 1.5 yards of fabric and had a little less than ½ yard left at the end of the project. I always like to get a little extra just because. Here are the PDF files for the Bottom Template Piece. You’ll need to print them out and tape them together to make one large piece. 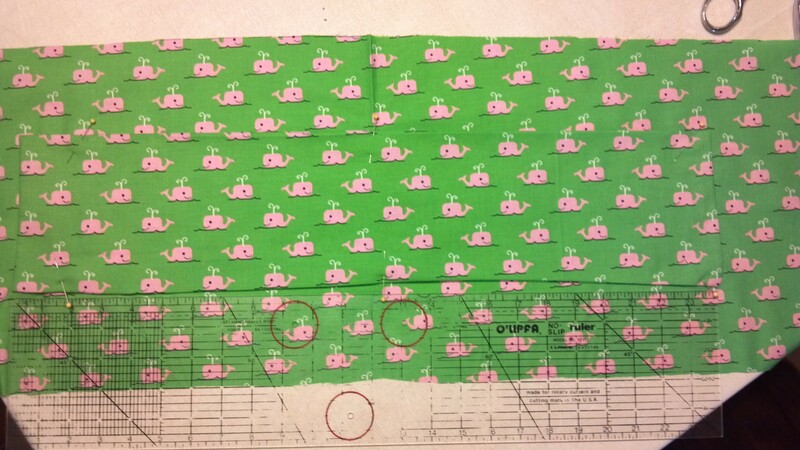 Make sure your printer prints the pages out at 100% by measuring the 1″ square that is drawn onto the pattern piece. If the square is not 1″ by 1″, then your printer settings are off. Optional: Since I didn’t add the plastic canvas in the crochet portion of the bottom of the bag, I cut another bottom template piece from extra heavy stabilizer I had on hand. I have included this extra step in the tutorial, but if you have used the plastic canvas you can omit this extra step. 1. Sew the bottom fabric piece to the stabilizer close to the edge of the fabric. 2. Sew the small 3×12 strip to the end of the 12×44 strip to make the side of the bag. Since the bag is 45” around and my fabric was only 44” around, I had to add a small piece to make the lining fit. 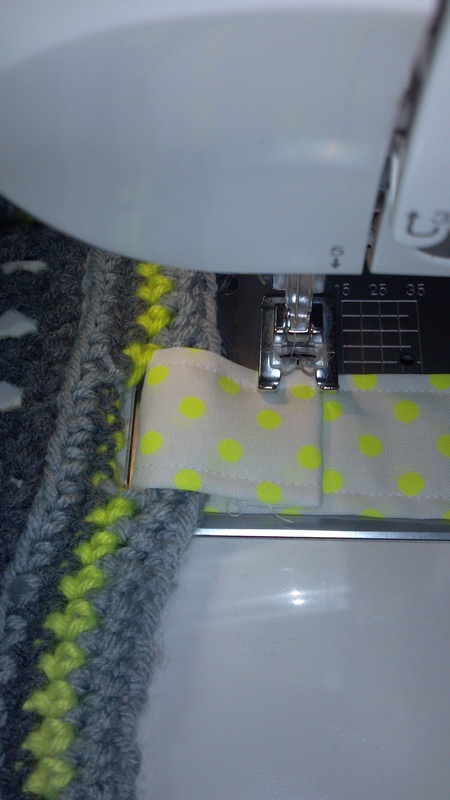 Use a ¼” seam allowance and serge the edge. I also serged the top and bottom of the strip at this point. 3. Take the 12×25 strip and fold it right sides together lengthwise (like a hotdog). Using a ¼” seam allowance, sew along one short side, sew along the long side, and down a portion of the other short side. Trim the corners of the fabric and turn the strip right side out through the hole left in the un-sewn section of the short side. You will now have a piece that measures 6” wide by 25” long. 4. Find the center of the side of the bag strip and mark it with a pin, then do the same for the pocket strip. The TOP of the pocket will be the fold and the sew side will be at the bottom of the pocket. Line up the pins and start to pin the pocket in place. I added the pockets a little lower than halfway so that full pockets wouldn’t tip the bag over as easily. I measured up 2” from the bottom. Sew along the short side, across the bottom, and up the other short side. I back stitched to the top of the pocket to reinforce the top of the pocket. 5. You’ll have one big, long pocket at the point. You could leave it like that, but I divided mine up. Mark the pocket at 3”, 6”, 12” and 18”. This makes 2 small pockets and 3 large pockets. Sew straight lines along the marks. Don’t forget to backstitch to the top of the pocket to reinforce it. 6. Now, we’re going to make the side strip with attached pocket into a tube. 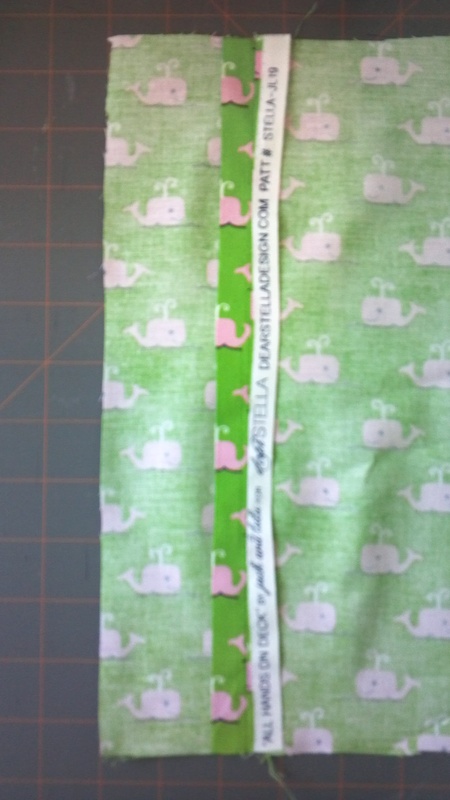 Pin the short ends right sides together and sew together using a ¼” seam allowance. Serge the raw edge and set it aside. 7. Next step is to make the handles. 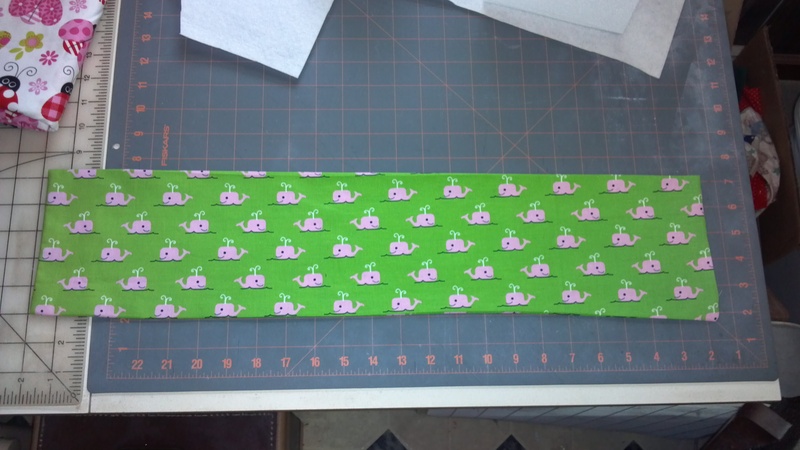 Find the three 6×24 strips and sew them together using ¼” seam allowance to make one long strip. Iron open the seams, then fold the strip lengthwise (like a hotdog) and press along the fold. Open the strip back up and fold the sides back towards the center press mark. Then, fold the two sides together and pin in place. Your strip should now be 1.5” wide. Continue to fold and pin all the way down the strip. 8. Sew along the fold close to the edge. Turn the strip and then sew close to the edge down the other edge. You should have sewn down both long edges of the handle strip. Now, fold the handle in half and cut it in half. This will make two handles that are 1.5” wide by approximately 75” long. Serge the unfinished (short) ends of the handles. 9. Now, we’re going to attach the fabric handles to the crocheted bag. Insert the end of the handle through the strap hole from front to back. Overlap the end of the handle onto itself about 2 inches. Fold the serged end down a bit and then sew along the edge of the fold 3-4 times to reinforce the handle. Repeat for all 4 ends of the handle, remembering that the handles do not cross over the bag (see original crochet handle pattern for additional explanation). Set the bag with attached handles aside. 10. Next, we are going to make the fabric ribbon strip for the bow that is woven through the X & O crochet stitches of the bag. Sew the two 4×44 strips together to make one long strip of fabric. Fold the strip in half lengthwise (like a hotdog) and sew along one short end and along the length of the strip, leaving the other short end un-sewn. Using a long dowel rod, broom handle, or another type of stick, turn the strip right side out. Iron the strip flat and then fold the un-sewn into the inside of the strip and stitch closed. I actually stitched both ends so they would match. Weave this strip loosely through the X & O crochet stitches of round 29 of the bag. Plan where you would like your bow to be placed and then tie it into a bow. The whale bag has the bow centered towards the middle while the neon and gray bag I shifted the bow towards the handle a bit. I like it both ways, but you choose what you like for your bag. 11. Almost done! Next we need to hem the top of the lining. Fold down the top serged edge towards the wrong side of the fabric, then fold it down again ½” and pin in place. Continue to fold down the edge around the entire top of the lining, then use your iron to press. Stitch close to the edge all the way around. 12. Now we’ll add the bottom piece. This may take some patience to get it pinned correctly, so take your time. First, figure out where you would like your pockets in relation to the inside of your bag. Do you want them on the longer side or the shorter side? 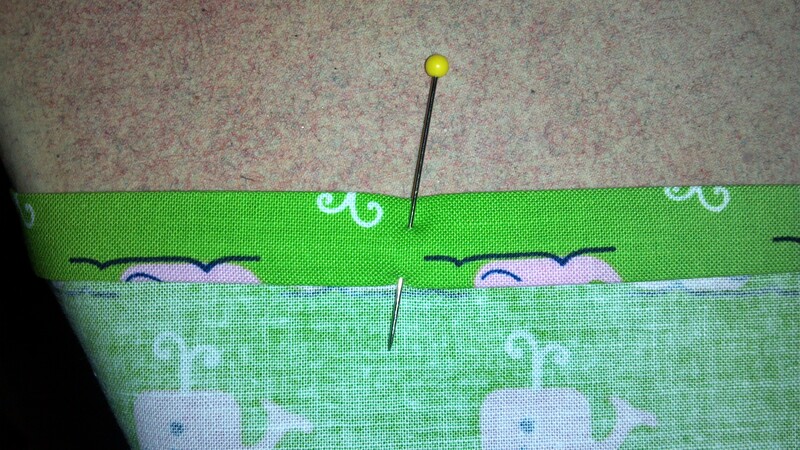 Start pinning the un-hemmed edge of the lining tube to the bag bottom right sides together. 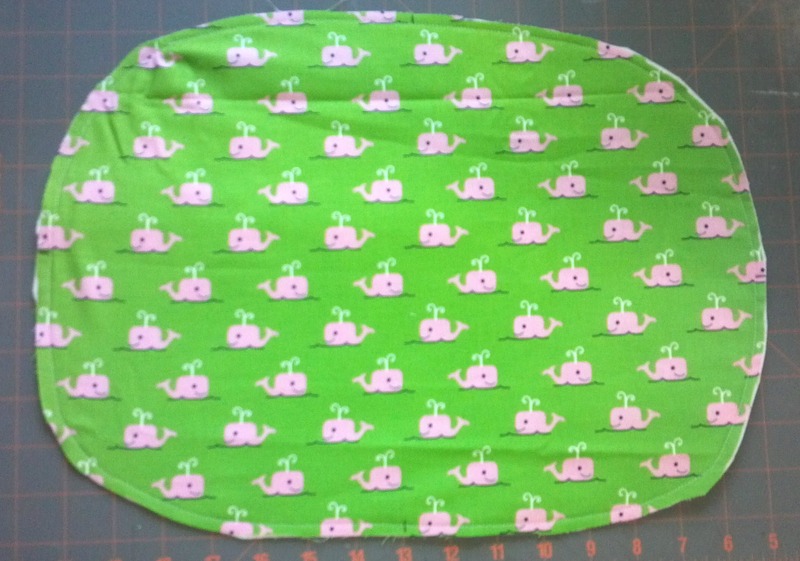 Around the curves of the oval, you may have to gather up the lining a bit to get it to fit. Using a ¼” seam allowance, sew the bag bottom to the lining twice. Once the bottom was attached, I serged the edge to keep the fabric from fraying. 13. Turn the crochet portion of the bag wrong side out. Turn the fabric lining right side out. 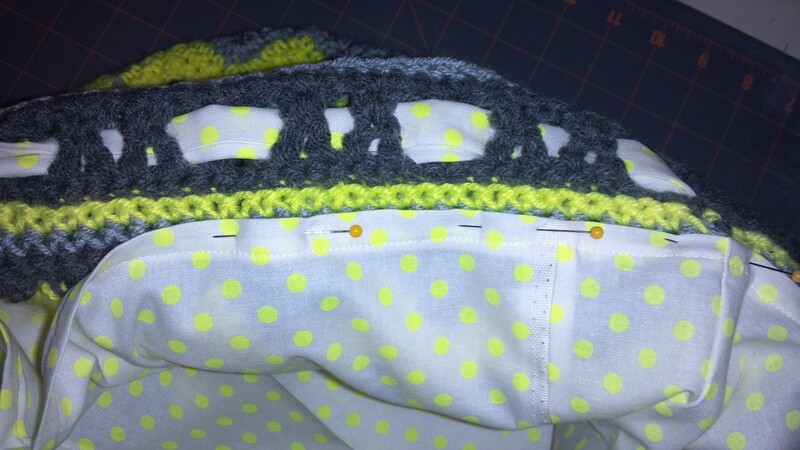 Using the end of your ironing board, line up the bottom of the crochet bag to the fabric bottom. Start pining the top hem of the lining between round 27 and 28 of the crochet bag. Be careful not stretch the crochet out of shape pining the lining. Once it is all evenly pined in place, you’ll need to hand whip stitch the lining to the bag using even stitches with equal tension all the way around. You could try to machine sew it, but sometimes the yarn tends to “move” too much this way. 14. Once this step is done, turn your bag right side out and enjoy your handy work! I would love to see your unique color and fabric combinations. Now, as promised, here is what I used for my two bags.